Harlem Hospital workers rallied today to stop proposed cuts in the number of doctors on staff. A few hundred people came out to a rally across the street from the hospital, one of New York City’s 11 public hospitals and one of the few health care options for the uninsured. The Doctors Council SEIU, which represents physicians at Harlem, called the demonstration in protest of a layoffs as the hospital ends its affiliation with Columbia University Medical Center. For the past 60 years, CUMC has been contracted to provide medical staff: currently, 20 out of out of 220 physicians will likely be laid off. Another 20 to 30 doctors plan to resign in protest. The doctors’ concerns were outlined in two “Open Letters” to the City’s administration and to Columbia University (first printed in the Amsterdam News and reproduced below. The Committee of Interns and Residents SEIU and a few DC37 locals also turned out members. The list of speakers included a “Who’s Who” of Harlem elected officials: David Dinkins, Al Sharpton, Charlie Rangel, State Senator Bill Perkins, local NAACP President Hazel Dukes and Charles Barron. These cuts, along with the rest of the recent layoffs across the City’s public health care system (Health and Hospitals Corporation, HHC), are part of the so-called “Road Ahead” plan developed by the Bloomberg administration and Alan Aviles (president of HHC). This plan, developed with the help of Deloitte Consulting firm, calls for a total of 10% reduction in the 40,000 member HHC workforce over 4 the next years. True to form for the Bloomberg administration, Aviles cites the importance of “Making Hospitals Lean”, based on a model borrowed from Toyota’s management strategy (see the Solidarity pamphlet “Lean Production: Why Work is Worse Than Ever, and What’s the Alternative? for an in depth analysis). Needless to say, cars and healthcare a different, but both plans are thoroughly anti-worker. The rally today shows a bit of energy from some of the unions at Harlem Hospital (though with fairly weak coordination or preparation among the rank-and-file). With a decent turnout and lively rally, we heard promises from the politicians that they’d “start the negotiations in earnest now!” and “make Bloomberg find the money!” But with no solid next-steps for building the power among the workers needed to force the City to back down, we’re left to wonder if this is the beginning of a campaign of escalating pressure, or if this was the extent of the strategy. Harlem stood behind you when you needed its support for the Manhattanville expansion. Why do you abandon it now, sitting idly by as medical care at Harlem Hospital is outsourced? For nearly sixty years, Columbia has supported Harlem Hospital in providing quality care to its neediest. Why do you abandon it now, as neurosurgery and rehabilitation medicine services are being shut down? Harlem Hospital’s Level I Trauma Center leads the state and the nation in injury care and prevention. Why do you abandon it now, by allowing loss of these vital services to threaten its trauma designation? 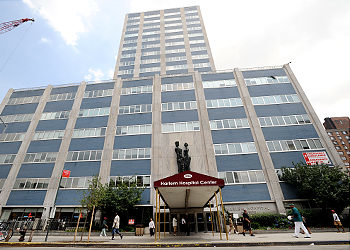 Harlem Hospital is the only reliable source of specialized tertiary care for the citizens of our community. Why do you abandon it now, as medical and surgical specialty services wither for lack of sufficient staff? Columbia’s support of Harlem Hospital has brought our community many of America’s finest physicians. Why do you abandon it now, letting the City bring in less accomplished doctors just to save a few dollars? Harlem Hospital has championed Columbia’s mission to “discover, educate, care, lead” for generations. Why do you abandon it now, as training programs attracting minority doctors and scientists are gutted? politically motivated excuse to divert a multimillion dollar contract to a favored “vendor” with little experience and a limited record. The Medical/Dental Board of Harlem Hospital has also not forgotten what ensued at a sister institution a dozen years ago, when the Health and Hospitals Corporation likewise outsourced medical care to nonacademic doctors. What followed was real scandal after real scandal, where real patients died, leading to months of monitoring by State and Federal agencies—unlike the carefully orchestrated, trumped up “scandal” regarding echocardiograms at Harlem Hospital that hurt no one, the full story of which is not being told, because it was easier to blame Columbia doctors than callous administrators. In truth, Columbia doctors at Harlem Hospital are not only great physicians, they are great people. They do not deserve to be tarred with the brush of alleged incompetence, or worse, when their only “failing” has been to try to do more with less, as staff are cut, their leadership is decimated by firings without cause or due process, and their pleas on behalf of their patients are ignored by heartless executives who have tragically forgotten that care for our neediest is a right guaranteed by the New York City Charter. No doubt, Columbia is rightly disgusted by the ongoing efforts to paint it as villain, and rightly dubious of a one sided contractual relationship which encourages the City to treat our University as a cash cow that it simultaneously starves and milks. For it is well known the University has lost tens of millions of dollars over the decades in care it provided that was not properly reimbursed by the City, always with the same lame excuse—there were a few undotted “i”s and uncrossed “t”s in the documentation submitted. Corporation to turn to us in the first place. We implore you to stand and fight with us. A weakened “academic affiliation” simply cannot stand up against the power of a multibillion dollar Corporation, but our great University can. Columbia’s support of Harlem Hospital has never been more vital than it is today. We can unite to leverage the strengths of the University’s medical, nursing, public health, law, and business faculties to develop viable models for accountable care organizations that will serve the public health and the public good for years to come. Columbia lives and works in the Harlem community we all call home. Harlem has never abandoned our great University, and will never do so, because its citizens realize the tremendous strength and vitality it brings our community. Yet the reverse is no less true. Harlem brings Columbia a richness of society and diversity that exists virtually nowhere else in the City, if not the world, serving as a constant reminder of why it exists at all—to find solutions to the problems that beset humankind, both globally, and locally. We therefore call upon you to do what is right—help us care for our community, and our University. Columbia faculty at Harlem Hospital, together with colleagues from Washington and Morningside Heights, can and will find ways to provide health care more effectively and efficiently to our community. Do not let the Health and Hospitals Corporation rob Harlem of its most precious healthcare resource— quality care by physicians and surgeons of the Columbia University College of Physicians & Surgeons. On behalf of the 350 physicians, dentists, and allied health personnel that comprise the Medical and Dental Staff of Harlem Hospital, we write to deplore the recent actions of the Health and Hospitals Corporation in moving to terminate its long standing financial affiliation with Columbia University. For nearly sixty years, the Columbia doctors of Harlem Hospital have labored to provide high quality health care for the citizens of our community. We have come to this hospital to be part of both a great enterprise in care for the poor among us, and a great University that seeks to find solutions to the very problems that lead to material and social poverty, through delivery of health care to the Harlem community. Although much work remains to be done, much has already been accomplished. Harlem has the lowest risk adjusted mortality rate of all six Health and Hospitals Trauma Centers. Harlem’s Injury Prevention Program has decreased the rate of injuries to children by sixty percent. Harlem’s Stroke Center has won several major awards for its innovative early recognition program. Harlem has the only Baby Friendly Hospital, recognized for breastfeeding success, in New York City. Harlem’s Bariatric Surgery program has the lowest mortality rate among all New York City hospitals. Harlem’s Plastic Surgery program is among the best in New York City, yet is by far least the costly. Harlem Hospital and the community it serves under medical leadership that is more concerned about profits than patients. Indeed, due to the untoward effects of the recent economic downturn, we are told that the Health and Hospitals Corporation can no longer afford the investment in healthcare that brought us the above triumphs. We are told that further education and research on the conditions that lead to the suboptimal health outcomes experienced by impoverished communities are luxuries that must wait until another day. We are told that physician groups affiliated with the Health and Hospitals Corporation must reconfigure to become “accountable care organizations” that share the financial risk with the hospitals in which they practice. Yet, they can hardly do so, when they are already paid less than half what they would earn in private practice, and practice plans associated with municipal hospitals have been able to collect no more than about ten cents on the dollar. This is not a road toward recovery; it is a march toward mediocrity. We have nothing but great praise for those in the Health and Hospitals Corporation who have worked so hard to find a way for our municipal hospitals to escape the $1 billion structural deficit brought about by the perfect storm of skyrocketing pension costs, vanishing revenue streams, bankrupt state government, and Federal healthcare “reform” that denies reimbursement for routine health care of undocumented immigrants, while at the same time rightly mandating that they receive far more expensive emergency health care when the regular care being denied them results in deterioration in their medical conditions. We also have nothing but sincere thanks for Mayor Bloomberg, who allocated $350 million to the Health and Hospitals Corporation to help offset its $1 billion operating deficit during the current fiscal year. decisions to limit support for graduate medical education—since it will cost the Health and Hospitals Corporation nearly $500,000 to replace each resident trainee with far less comprehensively trained physician extenders. Last, we find it nothing less than a disgrace that public officials are determined to disregard irrefutable evidence that medical services rendered by Columbia doctors at Harlem Hospital were indeed provided, and to deny that repeated requests to fill vacant positions in our Division of Cardiology were made, yet went unheeded, year after year, resulting in the large backlog of unread echocardiograms sensationally reported in the press—decisions we believe could only have been made for the purpose of terminating the relationship between the Health and Hospitals Corporation and Columbia University, despite nearly sixty years of honorable service to the community, and vast improvements in the health of its residents. cannot justify retaining two other academic institutions—the New York University and Mount Sinai Schools of Medicine—to provide medical services at Bellevue, Woodhull, Elmhurst, and Queens Hospital Centers, when its stated reason for terminating its Columbia affiliation is that academic affiliations are too costly. City it serves for over two hundred fifty years? not take us back to the past. We have already been there. It has taken very many years of hard work by the Health and Hospitals Corporation and its medical school partners to engineer the remarkable success that recently has been realized. Do not destroy the very engines of that success—the partnerships that make it work.